Undocumented Students in California: What You Should Know, provides a quick and accessible snapshot of our state’s undocumented student population. 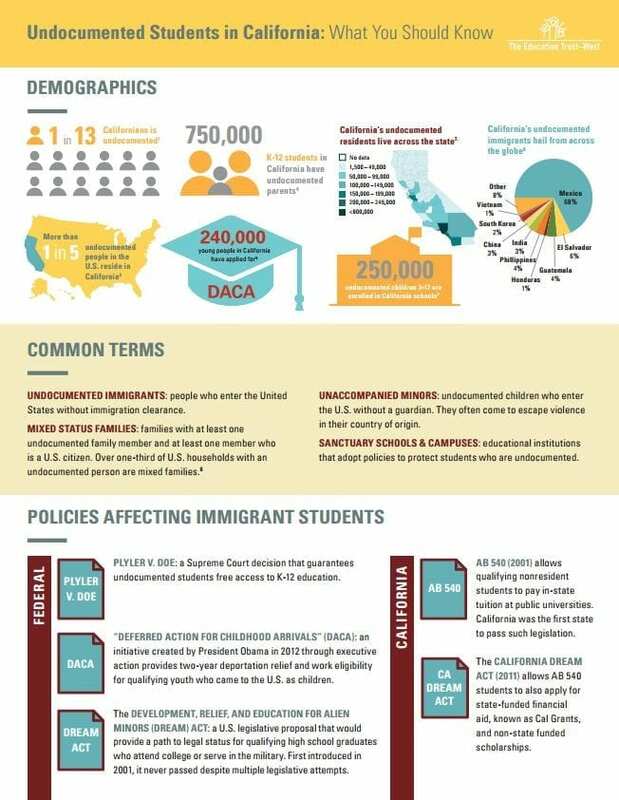 The resource highlights key demographic data on undocumented students in California, policies affecting immigrant students as well as opportunities and challenges to support these students. We share common terms and pertinent policy information to help California’s students, educators, policymakers and other stakeholders as they make important decisions and advocate on behalf of these students. Find the fact sheet, digital toolkit with sharable social media images, and a collection of additional resources below. United We Dream is a youth-led organization advocates for the fair treatment of immigrant youth and families by providing organizing resources. Educators for Fair Consideration empowers undocumented youth to achieve their educational and career goals through financial support, leadership building, resources, and partnerships. Immigrant Legal Resource Center works with and educates immigrants, community organizations, and the legal sector to strengthen democracy with a lens toward diversity and human rights. Mexican American Legal Defense and Education Fund (MALDEF) is a Latino civil rights organization that promotes social change through advocacy, education, and litigation in a variety of areas. ACLU works to defend civil rights, including due process and equal protection rights for immigrants. California Dream Network is a statewide network of college campus organizations working to address undocumented student issues through organizing efforts. California Student Aid Commission (CSAC) is a state agency responsible for administering postsecondary financial aid programs in California. The Coalition for Humane Immigrant Rights of Los Angeles (CHIRLA) organizes immigrants and families around civil and labor rights. UCLA Labor Center is a research department within UCLA focused on labor rights issues. It houses the Dream Resource Center, which serves as a resource for immigration research and policy. Asian Americans Advancing Justice works to advance civil rights for Asian Americans and to promote a fair society for all. UC Undocumented Legal Services Center operates out of the UC Davis School of Law and provides free immigration legal services to students across the University of California system. Centro Legal de la Raza is a legal services agency advancing the rights of low income, Latino, and immigrant communities. Services, Immigrant Rights & Education Network (SIREN) is a coalition of immigrant rights activists working to empower immigrants and refugees in the Bay Area through community organizing, policy, and naturalization services. Long Beach Immigrant Rights Coalition works toward more just immigration policies through education, service, and advocacy. Collaborative Resources for Immigration Services on the Peninsula (CRISP) is a collaborative of seven member organizations on the San Francisco peninsula that provide free or low-cost immigration services to children, families, and the elderly.